I’d guess that nearly everyone knows someone who has had their gallbladder removed. At one point, the medical community thought gallbladders had a small role in the body, so it became common practice to remove it at any sign of trouble. However, your gallbladder ensures you can digest your food correctly. Those who have had their gallbladder removed often suffer from chronic digestive complaints, like bloating and diarrhea. Your gallbladder stores about 50 mL of bile (about 2 fluid ounces), which is released when food-containing fat enters your digestive tract. The bile, produced by your liver, breaks down fats and neutralizes acids in partly-digested food. After being stored in the gallbladder, the bile becomes more concentrated than when it first left the liver, increasing its potency and intensifying its effect on fats. Most digestion occurs in the upper intestine (aka the duodenum) where bile is released. My sister was shocked to realize that she inherited our dad's poor gallbladder (who had it removed in his early 20s). She refuses to have it removes and, instead, has developed a way of eating that prevents the need for surgery. Despite her amazing diet, she occasionally suffers gallstone attacks, which, sadly, many women experience after age 35. 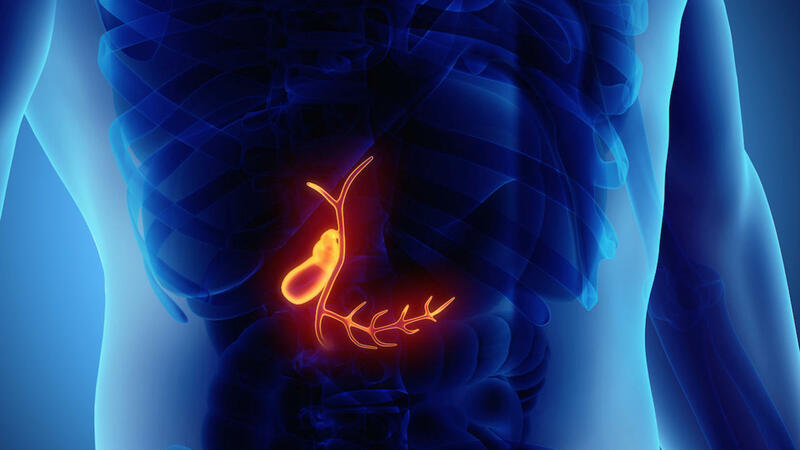 When you have Celiac Disease, you have reduced cholecystokinin release, meaning that your gallbladder doesn’t receive the signal to release bile for digestion. Your bile sits in your gallbladder much longer than normal, and therefore has a higher chance of causing gallbladder issues. It's important to discover what foods to which you may have sensitivities, ad you can do that by paying attention to how you react to certain foods. I suggest you do complete my Hot Detox Plan and, after 21 powerful days, reintroduce foods carefully, watching for symptoms. Large meals can aggravate symptoms. 3. Keep hydrated by drinking at least 8 glasses of water every day. Hydration helps you digest and absorb fat (most gallstones are composed of cholesterol) and helps keep the bile in your gallbladder fluid. Drink bitter herbs like dandelion, yellow dock and stone root to help promote the flow of bile. If you have gallbladder disease, consider taking 500 mg of active turmeric daily for its anti-inflammatory effects. 4. Do not eat fried food. Keep your fat intake to about 25 percent of daily calories. A high-fat diet can trigger your gallbladder to release bile and set off an attack, if you already have gallstones. 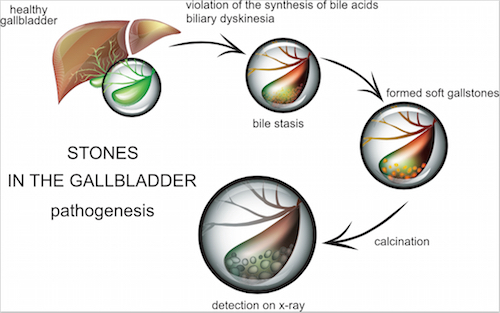 Be wary of very low-fat diets, which can promote the formation of stones by failing to stimulate normal gallbladder contraction and flow of bile. Definitely continue eating healthy fats and oils. When it comes to your gallbladder, it's a “Use It or Lose It” deal. Healthy oils included Omega-3 fish oil, coconut oil, olive oil, avocado and raw nuts & seeds. 6. Reduce dietary cholesterol intake. Dietary cholesterol is important; though if you have a gallbladder issue, it's best to limit your cholesterol consumption to 300 mg daily. Keep in mind that eggs, dairy and organ meats are the sources of highest cholesterol. 7. Remove sugar and refined carbohydrates. Both sugar and refined carbs can promote gallstone formation. By increasing your daily fibre intake to 35g/day you'll help to reduce gallstone formation. The pectin in apples are a great source for bumping up fibre becasue every apple contains 5g of fibre! 9. Eat your veggies... and give espresso some thought. A reduced risk of gallstones has been found in people who eat large amounts of vegetables and... coffee drinkers!?! There is an increased risk of gallstones in high meat diets due to the saturated fat. Coffee stimulates bile flow, though for best results, drink organic, fresh roasted espresso as the freshness of the oil in coffee is important. 10. Check for food allergies. Gallstone attacks may be linked to an inability to break down eggs, dairy and/or bananas. Eliminate them for 1 month and then reintroduce and watch for symptoms. 11. Aim for 30 minutes of daily exercise. Extra weight plays a role in the formation of gallstones. Get your yoga on! 12. Get your Vitamin C and Vitamin E.
Increase your food sources of Vitamin C and Vitamin E, AND supplement with 200 mg of Vitamin C and 80 mg of natural Vitamin E complex daily (containing both tocopherols and tocotrienols or mixed natural tocopherols at 400 - 800 IU). These vitamins can reduce the amount of cholesterol in bile. Additionally, choline found in lecithin helps to promote healthy bile flow – and consider taking a multi-mineral supplement as minerals bind to bile acids and decrease the risk of gallstone formation. 13. See a Doctor of Traditional Chinese Medicine (TCM). A TCM doctor can be very helpful because they can help balance your liver and gallbladder with supportive herbs and acupuncture. Q. Am I having a gallbladder attack? Biliary colic is a very specific type of pain, occurring as the primary or only symptom in 80% of gallstone sufferers who develop symptoms. Biliary colic occurs when your bile ducts are suddenly blocked by a gallstone. Behind the stone, fluid accumulates and distends the ducts and gallbladder. It is a constant pain, it does not come and go, though it may vary in intensity while it is present. It lasts for 15 minutes to 4-5 hours. If the pain lasts more than 4-5 hours, it means that you most likely have a complication – see your doctor immediately. The pain is usually severe, and movement does not make the pain worse. In fact, walking about or writhing (twist the body in different positions) in bed can often result in a more comfortable position. Your pain can be accompanied by nausea and vomiting. It is felt in the middle of the upper abdomen just below the sternum, though the second most common location for pain is the right upper abdomen just below the margin of the ribs. This can make it feel like you have pain in your back or kidneys; know it is just referred pain. Q. I'm having a gallbladder attack! That do I do? 1. Speak to your Doctor about determining the type of attack you are experiencing. You will need to have an ultrasound. Do you have gallstones? If so, I suggest speaking to a Naturopathic Doctor or Holistic Medical Doctor about remedies that can help you safely flush gallstones. Do NOT use a home remedy for this! It is extremely painful to have a gallstone lodged in the bile duct. It is important to be carefully monitored during a flushing process. If you are experiencing a inflammation that does not include gallstones, follow the Top 13 Tips above to prevent or reduce attacks. Unfortunately, the beginning of a gallbladder attack can be mistaken as hunger. Eating will contribute to your pain! 3. Homeopathic to the rescue! Look into using the Tissue Salt Natrum sulphuricum, especially during an attack. Again, speak to your Naturopathic Doctor, Osteopathic Doctor or Holistic Medical Doctor about homeopathic remedies. 4. Apply heat and pressure over your gallbladder. Take a hot water bottle and lay on it. This will often reduce the pain quickly. A hot bath can also be helpful, though the direct pressure of laying on a hot water bottle can go along way in helping you get through an attack. Follow up with your holistic practitioner. I seriously hope you are lucky enough to never experience a gallbladder attack. If you do, I trust you’ll follow these tips. Keeping your gallbladder is important for your long-term health, so please consider applying this information before considering surgery. You’re digestion will thank you for it!